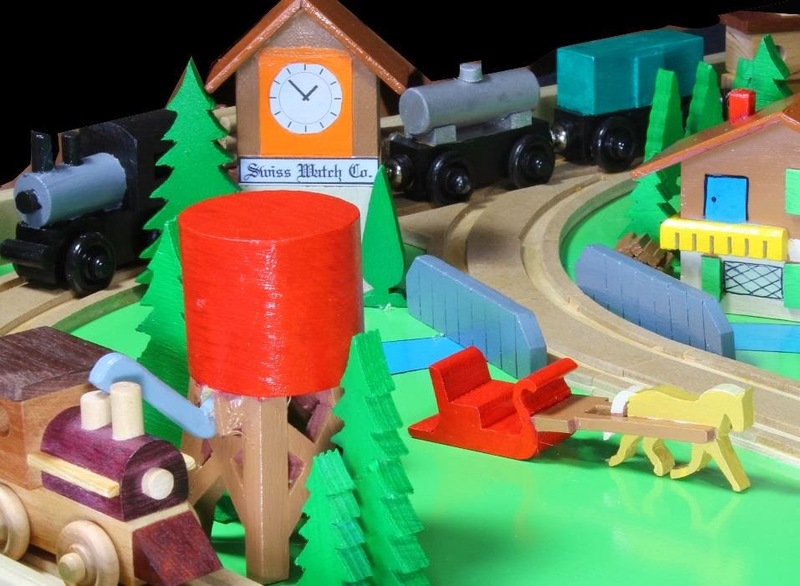 With the enormous popularity of wood trains, Forest Street Designs announces a plan to build a deluxe train set for a youngster’s first train. Nearly all wood and packed with details. It is set in the Alpine mountains of Switzerland at the base of the Matterhorn. Three- five car trains and a trolley travel through Swiss farmland, over a trestle and into four tunnels. 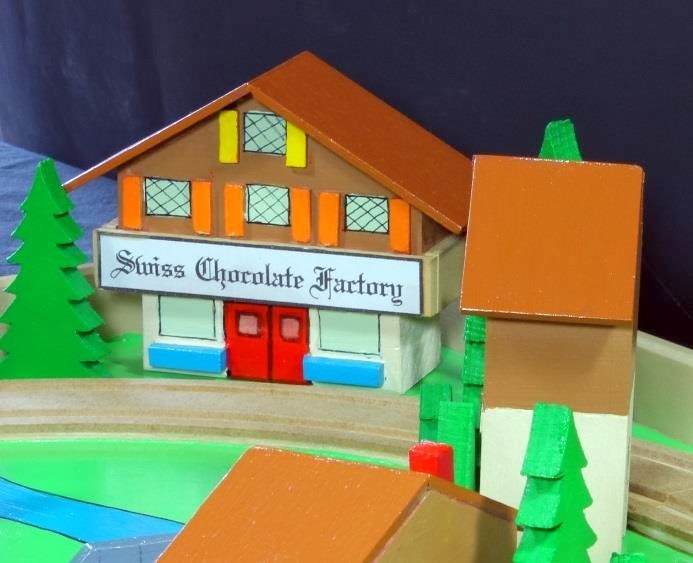 There are dozens of features including delightful Swiss houses, a mill, water tower, a Swiss chapel, barn, clock tower and dozens of pine trees and grazing cows. Trains store in drawers in the center section. The sides fold up and latch for fast, compact storage in a closet or under a bed. 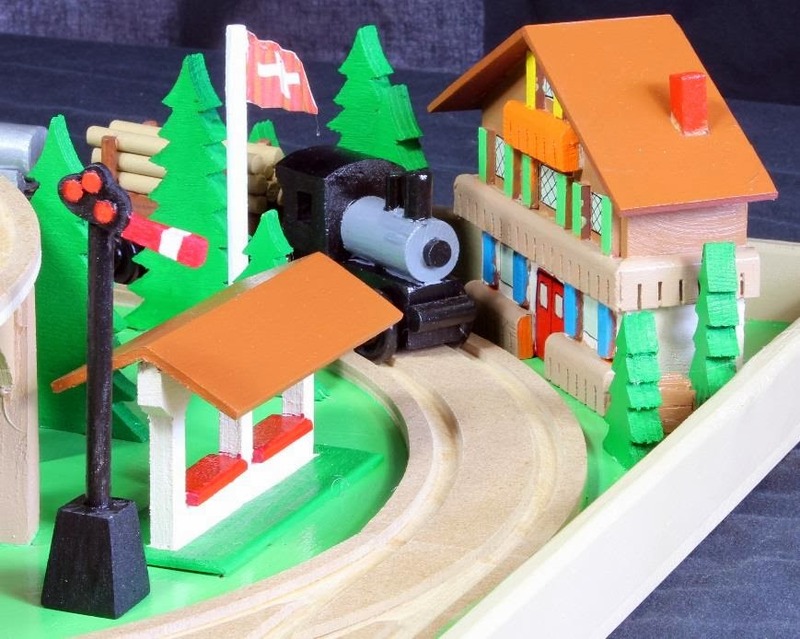 Trains and track are compatible with the numerous commercial wood train sets in the marketplace. The Alpine Wood Train plan includes line drawings of Swiss scenery on both sides of the divider. A color guide lists colors in acrylic paints for everything. 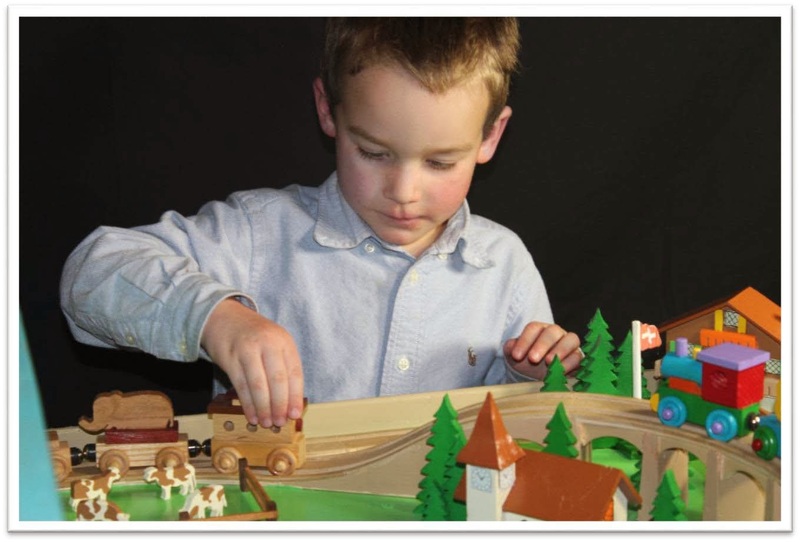 Extras can be left unattached so children can set up their own villages. Open size: 52" wide, 29" deep, 9 1/2" high. Closed size: 29" wide, 25 1/4" high, 5 1/4" thick. 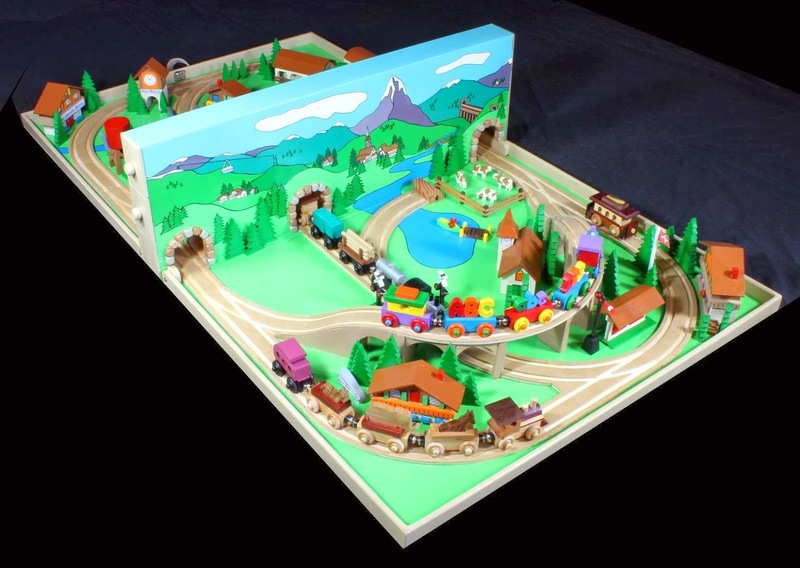 To purchase the Alpine Wood Train Set Woodcraft Plan (#WC-426) Click here! ...and it all closes for easy storage after play. 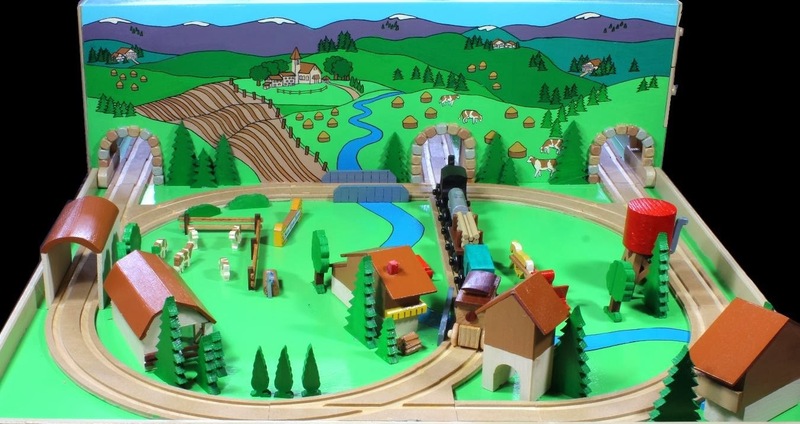 Three train sets and a trolley have full size patterns. 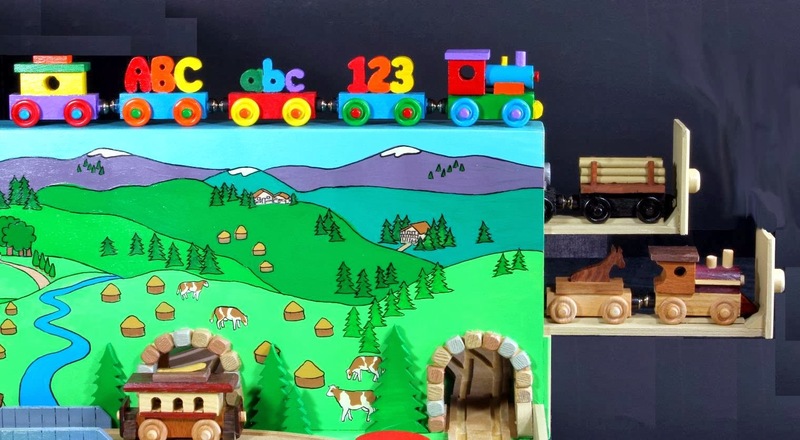 Letters on the ABC train can spell out a youngster’s name. 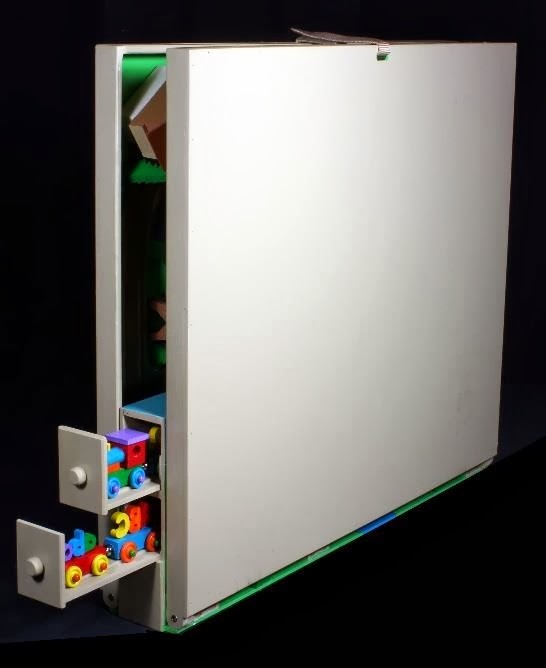 Compact storage drawers fit above the tunnels. A mountain stream passes by the mill. Once done it will be something you can pass on for generations. Woodcraft Plan (#WC-426) Click here!